If you’re a drummer, you know the satisfaction of sitting behind a good set of drums and pounding out your favorite song. But in today’s society where many family members live in the same place, apartments are common and even houses are often close together, it can be disrespectful to do so. An electronic drum set may help you solve this problem. With the volume knob turned down, you can rock out as much as you want with no one else hearing you. The Nitro Mesh Kit is Alesis’ line of all mesh kits. It gives a realistic playing experience and natural feeling, as well as an ultra quiet response. This kit comes with the Nitro Drum Module, which is loaded with 385 percussion sounds, 40 different kits, and 60 built-in play-along tracks to help you with your drumming journey. The mesh snare drum, mesh toms, and cymbal provide a high-quality playing experience on par with a traditional drum set. Setup is super easy; you can play practically right out of the box with all the cables, power supply, drum key, and even drumsticks provided. With a 1/8-inch headphone input, stereo ¼-inch TRS inputs and a 1/8-inch aux input, you can play in virtual silence or pump up the volume, whatever your preference. Using Nitro Mesh’s USB-MIDI and MIDI In/Out ports, you can transmit MIDI information directly to a computer, hook up your synthesizer and drums, or have a ton more options for expanding your drumming potential. Roland V Drums are a good choice for anyone who wants superior sound, durability, and an authentic feeling of traditional drums. This high-performance kit is both space-saving and noise-reducing, making it ideal for people who have to practice in a tight environment, especially around other people who may not be so keen on loud drumming noises. The TD-1KV offers a wide selection of drum kits for playing any musical style, plus training and recording functions. That way, you can make sure to continually build your skills and check how you’re progressing. This drum set is simple to operate, with a control panel that lays out all the functions in an easy to access way. It is also very functional and completely adjustable for both children and adults. Even the angle of the snare pad and the height of the cymbals can be adjusted. The built-in USB-MIDI interface makes it easy to send information to your computer or synthesizer. The training functions that are also built into this drum kit encourage learning in all forms, whether you have a teacher or are teaching yourself. 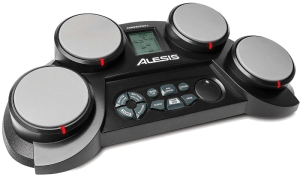 The Alesis Compact Kit 4 is a versatile tabletop electronic drum kit perfect for the aspiring drummer, the person potentially interested in drumming, and the person who has little space for a real or even typical freestanding electronic drum set. The four sensitive drum pads deliver the realistic feelings and responses of traditional drums. Built-in songs and rhythms are included, so it is very convenient for the percussionist who wishes to practice on their own without a band or accompaniment. There is an LCD screen with all the information you need, a music coach to help you play better, and even a built-in game function. The Compact Kit 4 has 70 percussion voices, 10 effect voices, and 50 play along songs so you can have a wide range of options in your playing. It has a speaker for times when you want to fill the room with your music, and a headphone jack for times when you need to be a little quieter. The Compact Kit 4 is typically powered from an AC adapter, but if you need to take it on the go it can also use 6 C-Cell batteries. Drumsticks are included with the kit as well, so you don’t have to worry about that either. 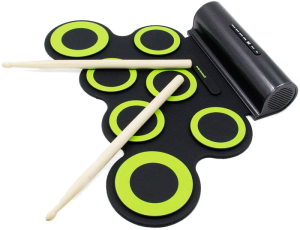 The Pyle Tabletop Digital Drum Kit is a tabletop kit that provides customizable sound and compact portability. This drumming machine is loaded with hundreds of built-in sounds, songs, and drum kits so the seven touch-sensitive drum pads can produce a wide range of realistic audio. You’ll also have the ability to import your music by connecting the drum kit to your computer. Then you can record, save and edit your drum recordings. Built-in speakers can play your music for everyone to hear, or keep your rocking out to yourself by plugging in your own headphones. The system even includes two digital foot pedals so you can get the feel of a traditional kick drum and hi-hat. The Drum Trainer Mode is perfect for beginners or those who are self-teaching. The kit also has a Hand Percussion Mode, built-in metronome, digital LED display control center, and the ability to make sound configuration adjustments to the beat, rhythm, tempo, and EQ. The system is powered by 6 C-batteries, making it very portable and convenient for out of the house sessions. 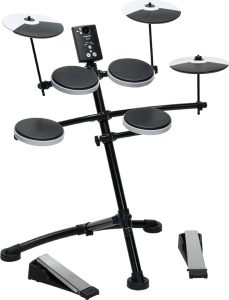 The PAXCESS Electronic Drum Set is a tabletop drum kit that is perfect if you want to practice in an apartment or other small space but don’t want to disturb your family or neighbors. Perfect for late night playing and portable enough to take anywhere, this is a great alternative to a traditional drum set. This kit includes 1 snare, 3 toms, 1 crash, 1 ride, 1 hi-hat; 2-foot pedals, and 5 timbres. There are also 8 demo songs and 3 rhythms you can play. This drum is powered by a 2400mAh (Milliamp Hour) rechargeable battery with up to 10 hours playtime per charge. Electronic drum sets are types of synthesizers that are meant to produce close replications of traditional drum sets with some added benefits such as portability and noise reduction. An electronic drum consists of a sound module that makes synthesized percussion sounds and electric sensors on the drum pads to trigger the sounds. The sensors are struck by drumsticks or by the hands, like a normal acoustic drum kit, so they are played in a similar manner as an acoustic drum kit. 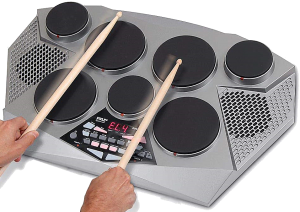 The electronic drum pad is usually sold as part of an electronic drum kit, which consists of a set of drum pads mounted on a stand or rack. The configuration is usually very similar to or the same as that of an acoustic drum kit layout, with rubber or special electronic cymbals. The drum pads are discs or shallow shells made of various materials, often with a rubber/silicone or cloth-like coated playing surface. Each pad has one or more sensors that generate an electric signal when hit by drumsticks or hands. The electric signal is transmitted through cables into an electronic module, whether synthesizer or another device, which produces a sound in relation to and triggered by the pad that was struck. The sound signal from the drum module can typically be plugged into an amp or PA system for use in a live band performance. Many people also use the headphone jack, a sound output unavailable to a traditional drum set. Using headphones is a great way for players to remain relatively quiet while practicing around family or in any other space where noise would not be appreciated. Since the advent of digital drums and the spiking of their popularity, companies have started selling drum kits with various other sounds int hem in addition to the typical “drum” sound. 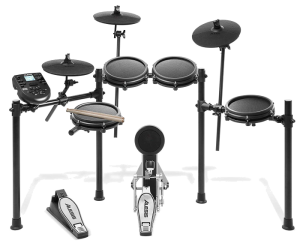 A MIDI-equipped electronic drum kit can be used to play many types of MIDI sounds, including piano, violin, flute, guitar or practically any other instrument. The basis of electronic drums originated in the 1960s when a man named Felix Visser, a Dutch drummer who was into sound engineering, created a machine called the Ace Tone electronic rhythm box. This was an early rhythm machine which enabled its users to play live gigs with a few rhythm presets. While this was not a drum or even a drum-like apparatus, it did pave the way in terms of motion triggering sound. The Syndrum, the first commercially available electronic drum, was announced and put on the market in the mid-1970s. It was soon adopted by my famous drummers such as Jeff Porcaro, Carmine Appice, Terry Bozzio, and many more. Beginning in the late 1970s, the Simmons company began producing electronic drum sets. The SDS-5 model became quite popular with many ‘80s rock bands such as Duran Duran, Wang Chung, Spandau Ballet, Def Leppard, and many more acts. Yamaha, Roland, and other companies soon joined in on the action with their own models. These electronic drums were similar to today’s entry-level kits. Even though they are not completely silent, as striking anything will still produce some kind of noise, electronic drum sets are considerably more quiet than traditional drums. Drummers can practice in near silence without anyone being disturbed. Following on that, since electronic drums can be played at a significantly lower volume level, when playing in a band the volume can be adjusted accordingly and there is no need for other members to alter their volume to accommodate the drummer. This is helpful in smaller rooms or older architectural settings, where volume is not necessary as at a rock concert. Electronic drum kits are more portable, easier to set up and take up less space than a traditional drum set. Electronic drum sets are typically much smaller than normal drums and can fit in tight spaces like apartments or closets. When equipment such as sticks, mallets, and brushes are used with electronic drums instead of traditional ones, they last slightly longer. This is because many electronic drum sets use rubberized rims and hoop protection that prevents direct stick contact with the metal. An electronic drum kit can copy the sounds of many acoustic kits as well as many different effects and instruments. There are so many options for so many situations. For instance, a drummer can play orchestral sounds, piano, guitar, bells, gongs, claps, etc. Using one acoustic kit along would definitely not have the same breadth and depth of a good electronic drum kit. Unlike traditional drums, electronic drums don’t need extensive microphone configurations during performances. Sounds are typically transferred through MIDI or line-out connections instead, so these drums can be used in a wide variety of situations more easily than traditional drums. Electronic drums have many features that make them useful to both beginning player and experienced players, even professionals. The control panel typically includes a metronome, play-along songs, a recording device for playback, and composition tools. Electronic drums cannot completely accurately replicate the sound of traditional acoustic drums. Most sought after features like realistic pads, sound modeling, and samples are generally limited to the more expensive sets, while affordable sets use simple single trigger hard pads and mediocre samples and modeling. Electronic kits always need at least one power outlet and some kind of sound amplifier to be audible in a concert environment, unlike acoustic drums which are loud enough on their own. Sound quality in electronic drum kits can be iffy. It depends on the quality of the product, the amplifier, speakers, headphones, and/or audio system. In terms of legality, different places around the world have different rules and laws regarding electronic products like drum sets, which may require some extra paperwork when a band is traveling. Modification or damage to an electronic drum system could cause an insurance policy on the item to be canceled out. With acoustic kits, most items (even from different companies) can be substituted and interchanged. This is definitely not true for electronic drums, because different companies have very different products that are only compatible with their own systems. High-quality electronic drums can end up being more expensive than acoustic systems, especially if you are a professional who needs a keyboard amp or sound system. During the inception of electronic drums, playing them was not quite the excellent experience we have today. Because of the material, they were tough and hard to play on without tiring and even injuring the hands, wrists, and arms. Luckily, in the modern day, we have mesh heads or rubberized pads that are much more comfortable. Mesh heads can have one to three sensors. Single-sensor heads trigger a single sound, while dual or three trigger heads can trigger multiple sounds based on what part of the drum or cymbal is struck. Mesh heads have a woven surface that makes them respond like acoustic drums a little more than rubber pads (which we’ll get to in a second). They can also typically be tuned to your preferred tension, and are usually more sensitive to touch than pads. Rubber pads are quite a bit cheaper than mesh heads and have a rebound effect similar to practice pads that you would use on a traditional acoustic drum set. They are generally considered not quite as good as mesh heads, though they are more affordable and would do perfectly well for an amateur player. Electronic cymbal pads can be shaped like a part of a cymbal, or look completely like a real traditional cymbal. Rolands V-Cymbals, as mentioned previously in the reviews, provide startlingly natural movement. There are some dual and three zone cymbals on the market now that allow for larger playing surfaces and more realistic experience. Similarly to mesh heads and cymbal pads, multi-zone hi-hats are now available. They have a great range of sounds and provide realistic playing. A drum module is absolutely and completely necessary for an electronic drum player. Without it, there’d be no sounds coming from the drums! The drum module is the processing unit for the sounds of the drums. When someone strikes the triggers or pads, it sends a signal to the module, which then produces the sound. Most drum kits can with a drum module, which makes sense since you can’t really use one without the other. Drum modules typically come with preset sounds, ranging from things like jazz to reverb to industrial. A more expensive drum module will typically provide better sound and sound effects. The best modules include all the average presets as well as unique sounds. The best modules even allow you to edit and create your own compositions. All drum modules on the market come with some with preset patterns that you can practice on before diving into the harder stuff. These are great for beginners and intermediate players who want to get some basics down but want to do more than rudiments. From Jazz to Pop to Rock, there’s something for everyone. The best modules should be able to nearly replicate the feel of an acoustic drum set. A good module needs to be able to sense the nuances in your playing and translate that into sound. The sensitivity of a module can usually be changed and tweaked to your preferences. Many modules also include effects to improve the ambiance of the sound when playing in different spaces. For the advanced player or even a beginner who wants a higher end product, look for a module that has good positional sensing – that is, the ability to sense where exactly you are hitting the mesh heads/pads/cymbals. There should be sound variations based on this. For the cymbal, crash shots, swells, and brush sounds should sound accurate to acoustic drum sets. On hi-hats, the sound from open to closed should be smooth and not sudden or jagged, and the module should be able to create nuanced differences for every position. On the mesh heads or rubber pads, the sound of open rolls, buzz rolls, and flams should also be smooth between hits. Snare buzz resonances should sound realistic also. The important thing overall is that when you try out an electronic drum kit, make sure you keep in mind how close it sounds to acoustic drum set. This can be important depending on whether or not you plan on expanding your system with more pads and sensors in the future. A USB port and audio inputs can be important for connecting to computers and synthesizers as well as potentially syncing music to play along to. An electronic drum set can be a great investment if it’s right for you. By buying one of these, you can jam out whenever you want, wherever you want, as well as have an excellent instrument to play on for concerts. 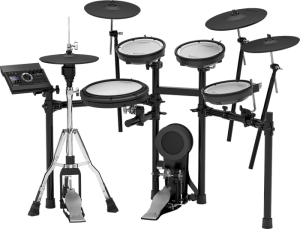 After reading this article, you have all the information you need to pick out an excellent electronic drum set for your budget and situation.